Heat a large pot over medium-high heat and add bacon. Add a splash of water and let the bacon render it’s fat. As the water evaporates, the bacon will brown. Pour off excess fat and add the onions, garlic and peppers. Cook until they are softened and just beginning to caramelize. 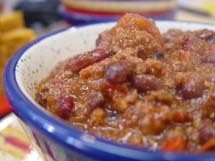 Add chili powder and ground beef and stir well, chopping the beef up with a wooden spoon. Add tomatoes and beans and season with salt and pepper. Simmer for an hour. If you have a chance, make this a day in advance and reheat when needed. The flavours will brighten and meld as it rests overnight. Forget fancy. 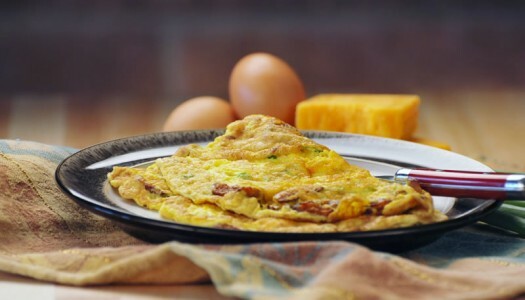 Here’s a simple way to make a quick tasty omelet for breakfast, lunch or dinner, complete with bacon and cheddar. Don’t be scared by the flip, you’ll miss a few but quickly get the hang of it! There’s nothing quite like a steaming hot soup bowl brimming with intense vegetable goodness. But not a fan of pale promises? Vegetable soup that’s more filler than flavour? No worries. 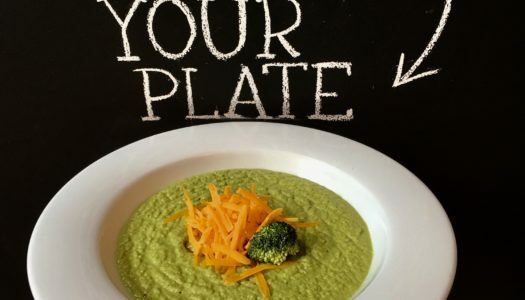 You can fill more than Half Your Plate with true broccoli flavour by following this super simple recipe. >Bacon and cheddar for even deeper flavour that’s guaranteed to satisfy any picky veggie-averse eaters. >Your choice of liquid so you can control how rich the results are. >How to make a pure vegetarian version.